Seriously one of my favorite week day dinners right here. So simple and versatile roasted vegetables with tahini dressing. For this meal I roasted sweet potatoes, broccoli, kale and tomatoes in the oven with a light drizzle of evoo black pepper and sea salt. While that was roasting I seasoned and pan fried the chickpeas and prepared my dressing. If you ask me, it's the dressing here that can make or break your bowl. 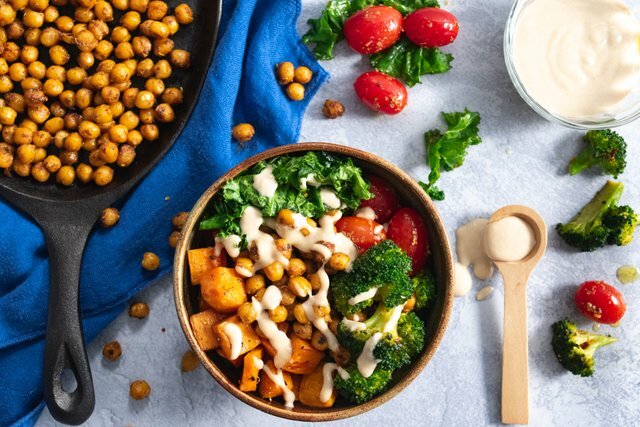 So here's the tahini dressing recipe for your next buddha bowl! I try to prepare this first so it can chill in the fridge before use. Dressing will keep stored in a small jar for 4-5 days. I hope you've enjoyed the photograph that I took to share with the Steemit community, its my passion to inspire health and I am grateful to share it with you!